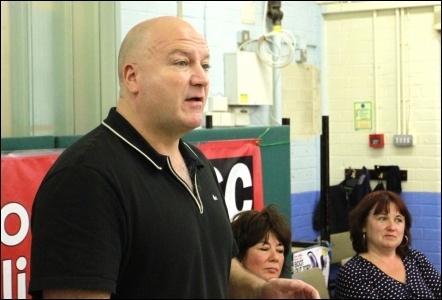 Bob Crow was a co-founder of the Trade Unionist and Socialist Coalition (TUSC) from its very beginning in the run-up to the 2010 general election. He sat on the TUSC national steering committee, initially in a personal capacity but, after the decision of the 2012 annual conference of the RMT transport workers union to be officially represented within TUSC, as one of the union's official nominees. Yet obituaries in the mainstream media have completely ignored his role in TUSC, with the BBC's website typical in stating that "Mr Crow was not a member of any political party when he died". But the facts of Bob's commitment cannot be erased. There are many videos of Bob in full flow putting the case for a new vehicle for working class political representation, which he saw TUSC as an important step towards. Last year we asked Bob for a quote to go on the TUSC appeal for candidates to stand in the May 2014 local elections. He came back with, "the Trade Unionist and Socialist Coalition (TUSC) does what it says on the tin - without any of the baggage and big-business agenda of the main political parties. "Who else you gonna vote for?". What don't the BBC and other establishment media understand about that?